Treat yourself (and your budget) to some delightful and inexpensive desserts this year. 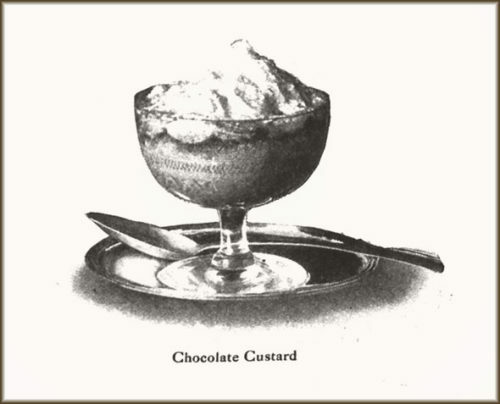 Treat yourself to a “10-cent dessert” from author Mary Harrod Northend, 20th-century New England’s precursor to Martha Stewart. Even in 2018, Northend’s recipes are easy on the mobile wallet. A hundred and five years later, one serving of any pudding, custard, or fruity delight will set you back between 20 and 205 cents. To prepare dishes which are palatable and yet are not too expensive is sometimes a difficult task. There are many good and nourishing dishes which, when prepared with care, need not add materially to the cost of the dinner — that is, if careful thought is given to making just enough and allowing for no leftovers. Often in preparing a dessert for, say, four people, a recipe is followed which will serve twice that number. This is both thoughtless and costly. The following recipes are made out and carefully tested for a family of four people. An approximate estimate is given, eggs being purchased at the rate of 25 cents a dozen and butter at 30 cents a pound. The cost of each dessert is 10 cents. Butter lightly slices of stale bread, allowing two slices to each person. Dip in milk and brown on each side in a frying pan. Serve the separate slices with a sauce made from one beaten egg, half a cupful of sugar, flavored with vanilla. One egg, one tablespoonful of beef dripping, a scant cupful of flour, a third of a cupful of milk, one teaspoonful of baking powder, and a little nutmeg. Bake and serve with a sauce made as follows: Brown about half a cupful of sugar, add half a cupful of water and one teaspoonful of cornstarch dissolved in a little milk with a small piece of butter. This makes a delicious caramel sauce. Mix two cupfuls of milk, scalded; one cupful of water, three teaspoonfuls of tapioca, two tablespoonfuls of Indian meal, a pinch of salt, and three-fourths of a cupful of molasses. Bake slowly one hour, and serve with a sirup made from prune juice. A fourth of a box or package of phosphated gelatin soaked fifteen minutes in a fourth of a cupful of cold water. Pour over this one cupful of boiling coffee and about two tablespoonfuls of sugar. Strain and cool in four small molds. When partially cold add about four nuts, finely chopped. Serve with whipped cream — a third or half a cupful would be sufficient. One pint of milk, one egg, one tablespoonful of cornstarch, one tablespoonful of chocolate or cocoa, a third of a cupful of sugar. Scald the milk in a double boiler, beat the yolk of the egg with sugar and cornstarch, the latter being dissolved in a little of the cold milk. Pour the hot milk on this and cook like a soft custard, adding a tablespoonful of cocoanut [i.e., coconut] before it has fully thickened. Beat the white of the egg to a stiff froth and add two teaspoonfuls of powdered sugar. Heap this meringue on top of each serving. Wash the rice and cook it in a sirup made as follows: Peel a lemon and slice the pulp, putting it in a saucepan with a third of a cupful of sugar and a little water. When boiling add the rice, about a third of a cupful. When soft put it in a baking dish with three cupfuls of milk, a little more sugar if necessary, and half a teaspoonful of salt. Bake about two hours, allowing it to brown slightly at the last. The pulp of the lemon should be removed from the sirup before the rice is added. Serve hot or cold. Wash and core four small apples. Fill the centers with sugar and two dates. Bake and serve with half a cupful of thin cream, whipped and sweetened with a little sugar. Boil half a cupful of rice fifteen minutes. Then pare and core four apples, cooking them until rather tender in hot water and then putting them into a sirup made of half a cupful of sugar and two cupfuls of water. The rice may be cooked in this sirup if preferred, as it gives it a better flavor. The apples are filled with the rice and served cold with little bits of jelly on top. Steam three large tart apples and rub them through a sieve. Beat the whites of three eggs stiff, add half a cupful of sugar and beat again. To this meringue add the apple pulp and beat lightly. Two cupfuls of whole-wheat flour, half a cupful of molasses, one chopped apple, half a teaspoonful of salt, half a teaspoonful of soda; steam two hours and a half. Serve with a plain sauce made with two cupfuls of hot water, one cupful of sugar, two tablespoonfuls of cornstarch, a small piece of butter, and half a teaspoonful of lemon extract or a teaspoonful of fresh lemon juice. This requires three-fourths of a cupful of tapioca cooked, until clear in four cupfuls of boiling water. Add half a teaspoonful of salt and half a teaspoonful of cinnamon. Fill a round baking dish with pared and quartered quinces, or the preserved fruit will answer if the uncooked is not obtainable. Pour the tapioca over them and bake until soft. Serve with milk and sugar. Peaches are also delicious served this way. Stone and chop half a pound of dates. Put them on the back of the stove with two cupfuls of water. When boiled down to the thickness of a cornstarch pudding, set away until cold. Serve with whipped cream, about a third of a cupful being sufficient, sweetened with powdered sugar. Place a teaspoonful of cocoanut in the bottom of individual glasses and make a custard out of two cupfuls of milk, the yolk of one egg, half a tablespoonful of cornstarch, and three teaspoonfuls of sugar. Pour the custard over the cocoanut and allow it to stand for an hour or so before serving. The whites of the egg is beaten and used for a meringue on top. To about four soda or butter crackers rolled finely, add two cupfuls of milk, a quarter of a cupful of sugar, the yolks of two eggs, beaten lightly, and a pinch of salt. Bake in a well-buttered baking dish in a moderate oven. When the custard is firm, cover the top with a meringue made of the whites of the eggs and half a cupful of powdered sugar; flavor with vanilla. Set in the oven until the meringue is a delicate brown.